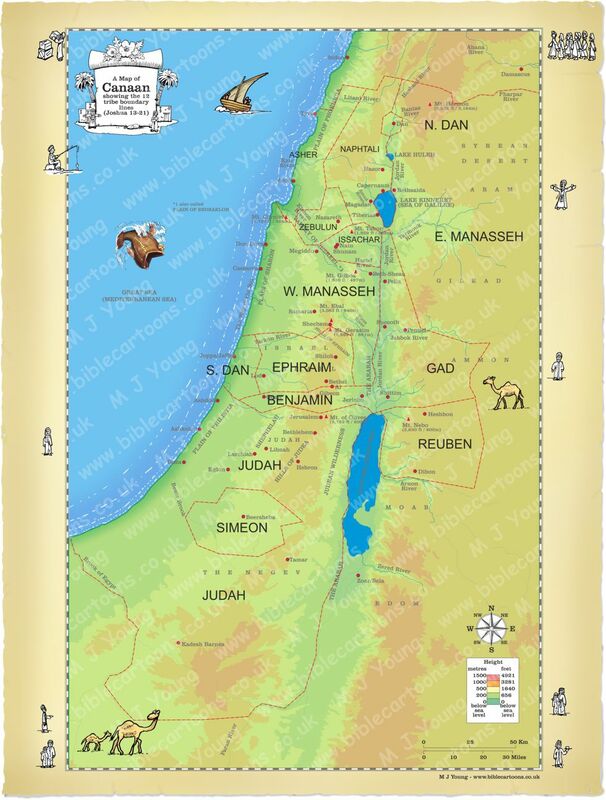 This map shows the land of Canaan, before it fell to the Hebrew people, in the time of Joshua. It shows how the land was divided up between the 12 tribes of Israel, although the Levites didn’t actually receive a portion of the land. There seems to be some debate about when the Book of Joshua was written: some scholars believe it was penned in the baylonian Exile, some put the date a lot earlier (closr to the life of Joshua himself). Adam Clarke’s Commentary puts the date of Joshua chp 01 as 1451 BC. The Hebrew people went into the Promised Land around 1400 BC. If you look carefully at the map border you will see I have included some little black and white figures, just for fun!